Welcome to the u30ws — a World Series for the next generation. So my Red Sox have finally been replaced as World Champions. Let’s all pause for a moment of silence. Okay. Congratulations to the 2008 World Series Champion Philadelphia Phillies for a spectacular World Series finish. They waited two days for these last three innings! The Rays pulled out every trick they could, but in the end, the bag was simply not deep enough. Congratulations to Tampa Bay on a fantastic season in which they shocked everyone by simply reaching the postseason, not to mention to World Series. 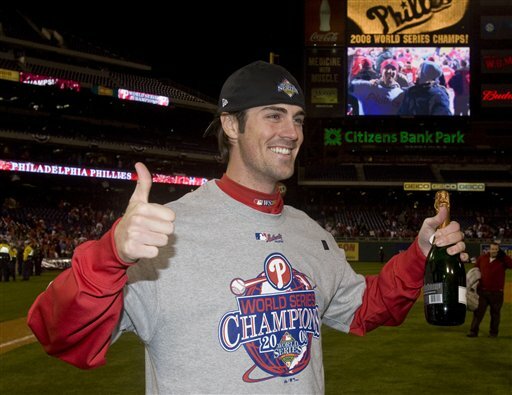 No one is more deserving of the World Series MVP than Cole Hamels. This kid was fantastic. He is the Josh Beckett of 2008, and with him on the mound, it’s almost as light’s out as having Brad Lidge pitch. By the way, Lidge closed out a tight game perfectly tonight. He allowed the plot to thicken just enough to allow fans to think that Tampa Bay had a chance, then he slammed the door in their face. I mean really, no one besides Tampa Bay fans wanted this series to go on any longer – we’d have to decide between baseball and Halloween. Very un-American (Sarah Palin, take note). In all seriousness, this World Series was fantastic. With the exception of Game 4, both teams kept it close, played their best, and showcased all that baseball has to offer. On one side, you had a very young team who’s highest player made $6 mil a year. That’s a bargain on the Yankees. On the other side, you had a spirited bunch who grabbed hold of their division while keeping the most senior ball player in the leagues from retiring. The big markets didn’t take this World Series; it wasn’t in New York or LA or Boston (side not to Floridians: 40 degrees is NOT cold enough for ski masks and ear muffs. It’s not even freezing) hosting the fall classic. It was two scrappy teams that illuminated and excited their respective cities, bringing people together under the name of baseball. And in the end, isn’t that what it’s really all about? Once again, congratulations to the Phillies. This is a fantastic accomplishment. Enjoy the parade and relish every moment of the next year. The Tampa Bay Rays all season long have been touting the mantra 9=8 all season long. If nine men play nine innings of good baseball, they will be able to be one of the eight in the postseason. Well, tonight the Rays will have to play 3 innings of good baseball. The most bizarre game in World Series history resumes tonight. Sorry, I almost said starts. It started two days ago. Both Joe Maddon and Charlie Manuel have had 36 hours to plot and plan until their brains burst. Joe Maddon even had time to get some more fashionable, Sarah Palin style glasses. They have had two days in between halves of an inning to think about the most minor details of the game at hand, who’s been used, who hasn’t been used, to get baseball’s closest equivalent to a 2 minute drill in order for tonight’s three inning game. It’s like little league all over again, but everyone involved is talented. The Rays only have three chances to keep their series alive. The Phillies have four chances to end it here. Who will end up on top? Stay tuned on FOX at (bizarre time, again) 8:37 PM. When you’re 18 years old, you often look at things saying, “I’ve never seen this before,” and wonder if it has actually happened before you were born. Last night, both Joe Maddon, who was alive during creation, and I had never seen anything like that game before. A World Series clinching game suspended in the sixth inning – what are the chances? As the game went on, it was obvious something had to be done. When grounder off of B.J. Upton’s bat slipped out of Jimmy Rollins’s hand, it was becoming very clear that the weather was a severe impediment to both teams’ abilities. Cole Hamels was pitching off of a mound of mud, second base was somewhere in the middle of the Infield Sea, and the wind was toying devilishly with anything hit in the air. I doubt there was any way to continue the game without the weather having a large impact, and I definitely agree that suspending the game was the right thing to do, but what does this mean for the rest of the Series? Hamels is definitely out of the game now, but would that have been the case in the seventh if the weather had been perfect? The teams will play three innings, instead of nine, to decide the fate of the season. This is effectively a new game. When will Game 5 even be finished? The rain and wind is still in Philly, pounding away and drenching the area. They certainly won’t start it again under the same weather that was in the area last night. Does the wait serve as an advantage for the Rays, so that they can get more rest in before what could be the most important three innings of their season? Does the wait serve as an advantage for the Phillies, who remain confident with a 3-1 series lead and give the Rays extra time to think about the perilous situation the Rays face. Would Upton have still been safe if Rollins had handled the ball cleanly? That play created the tie game – the Phillies might have been ahead if Upton had grounded out. This is a first for baseball, a first for me, a first for every fan. We’ll see what happens tonight. Until then, it’s time to cower under umbrellas or hide indoors (the rain has now reached Boston and it’s wicked cold, windy, rainy and gross here too). Edit: The weather in Philly looks reminiscent of a scene out of Noah. However, there is probably about a 2% chance of the umpires calling the game. Imagine calling a World-Series clinching game because of rain. Very anti-climatic. What would the Phillies do, charge the mound with their umbrellas? Improvise a slip-n-slide in the outfield? On another note, the umpires again have not been overly impressive. The strike zone for Kazmir was flat-out ameobic. Also, Utley’s double play, while definitely skillful, may not have actually been a double play. Did he actually tag the runner? The replays were unclear, but perhaps the umpires saw something the replays didn’t show. Correct call or not, the umpiring has definitely been sub-par for the entire series. When a pitcher hits a home run, the opposing team is in for a long night. Joe Blanton propelled his team a strangling 3-1 series lead last night after some top notch pitching AND hitting. The Phillies are clicking right now in every area of the game. They’re even getting breaks from umpires. To top it all off, the Rays will face Cole Hamels in Philadelphia tonight. The same Cole Hamels who has not lost a game in the playoffs and has a 1.55 postseason ERA. The same Philadelphia where the Phillies have not lost this postseason. It seems as if the Rays of hope are all but gone. However, the Rays did just come off of a series against a team who fell to a 1-3 deficit, seemed to have nothing going for them, then came back to force a Game 7. The Rays offense is still scary. They could explode at any moment. Let a Ray on a basepath and chances are, he’ll steal a base. Six teams have come back from a 1-3 deficit to win the World Series. October is the month of magic. We’ll see what magic both sides have cooking tonight at 8 on FOX. Hopefully the umpires will show up. It’s the ninth inning, it’s the bases loaded, it’s up at the plate just hoping for a fly ball deep into the outfield, it’s trying to handle a slippery ball in slippery fingers shaking from excitement. It’s the 2008 World Series, and the Phillies have a 2-1 lead. No matter what the math says, tonight is a must-win game for the Rays. If they have to face Cole Hamels in an elimination Game 5, the Rays will have more than a mountain to climb in order to grasp that trophy. Andy Sonnanstine must take that mound with every bit of composure he can muster, he must pitch his heart out, and the Rays must play their best game yet. On the other side, the Phillies cannot let their series lead get away. If they want the Rays in a chokehold, they must win tonight. The offense has to light up the scoreboard to give Joe Blanton every ounce of security he needs. They cannot let the game even get close, cannot let the Rays start whispering in hope, cannot let the Rays tie the series. It is Game 4 tonight. The lights turn on at 8 PM. Be there. The World Series heads to Philadelphia tonight, and the starting pitcher for the Phillies is almost as old as the Liberty Bell. Now, Moyer’s last game did not go too well. 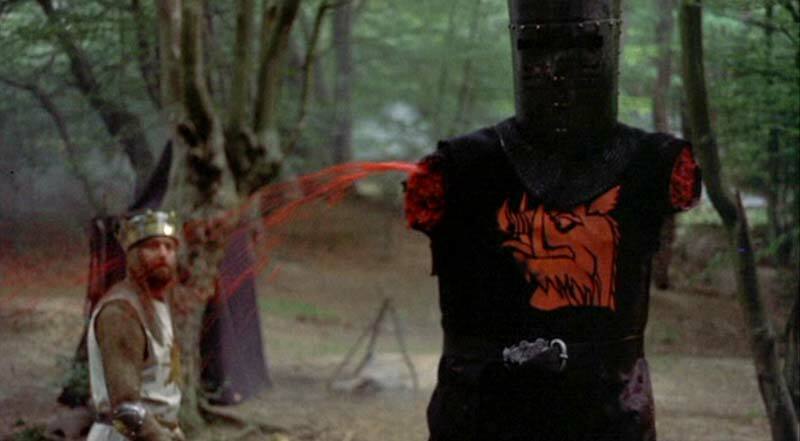 He struggled (to put it kindly) against the LA Dodgers, giving up six runs through 1 1/3 innings. In the NLDS, Moyer was not terrible against the Brewers and lasted four innings, giving up 2 runs on 4 hits, but the Phillies failed to provide any offense and Moyer ended up losing that game as well. He takes the mound tonight with a 13.50 ERA against a team that has been crushing baseballs out of the park all postseason, but there are four very important things to remember about Jamie Moyer. 1. He is an entire decade older than the oldest player on the Rays. Age = experience in baseball, so those extra years could mean a lot on a big stage. Where others may feel shaky and nervous, Moyer’s veteran status should help keep things in perspective for him. 4. It’s close to Halloween. If he doesn’t want to pretend to be the manager of the team should something bad happen, he could always dress up in some costume and run away. Halloween is one of the many benefits to having the postseason stretch late into October. It provides players/managers with a chance to disguise themselves if need be without looking suspicious. You didn’t think the Rays would sit back all series and be overrun by the Phillies, did you? Last night the Phillies had Ryan Howard hitting again, but that couldn’t save them from a powerful and overwhelming performance by James Shields, who, by the way, happens to be a member of the u30 team. In fact, all of the big players for the Rays last night (with the exception of the umpire) were members of the u30 team. 23 year-old David Price ran into a few jams last night, but he was able to get himself out of trouble and hold on to the win. As previously mentioned, Jason Bartlett, the taco winner, is 29. Longoria, Pena and Upton, who all knocked in runs for the Rays last night, are 23, 30 (we’ll forgive Carlos, he’s borderline u30 club) and 24 respectively. How big was Kerwin Danley’s half-out call in the second inning? On a 3-2 count to Rocco Baldelli, Danley raised his arm as if to call Baldelli out on a borderline pitch that Baldelli may or may not have swung at, but then proceeded to either check with the first base umpire or award Baldelli first base. The Rays were able to load the bases and knock in an insurance run in what ended up as a 4-2 game. Did that call (or non-call) change the pace of the game, or did it just expedite the inevitable? Strikeouts or no strikeouts, this series goes to Philly knotted at 1 game apiece. Rays in 5? Phillies in 5? Will the series stretch to 6 games or will it end in a do-or-die Game 7? Anyways, back to the Series. Ideally, Josh Beckett would be facing off against Brett Myers in Game 2, but the Red Sox ran into some mishaps in the ALCS, so the Tampa Bay Rays are representing the American League. Then there’s “Lights-Out” Lidge. For all the competition in the American League over which closer is the best, the National League probably has the answer to that. He was 41-41 in saves in the regular season and is six for six in the postseason. �At almost 32 years-old, he’s a little bit of a grandpa in this series, but Phillies fans will probably take it. P.S. Thanks for the�taco, Jason. has been groomed for this moment. fellow youngsters on display on the field.